Don’t let too much sun cut your boating day short! Non-corrosive, high density black nylon fittimgs. Bimini top with 3 archs in stainless steel AISI-316 of 22mm. diameter. Nylon deck terminal for bimini tops. 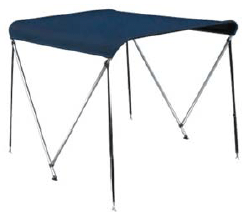 Nylon deck base for bimini tops. Base for biminis in inflatable boats. For guard-rails of 22 mm. Nylon sliding clamp for these biminis.